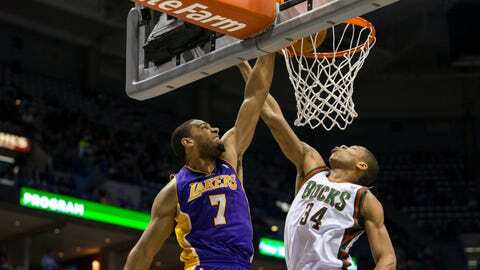 Lakers forward Xavier Henry (7) tries to dunk as Milwaukee's Giannis Antetokounmpo defends in the first quarter of the Bucks' 108-105 win on Thursday. MILWAUKEE (AP) — Struggling through one of the worst seasons in franchise history, Brandon Knight and the Milwaukee Bucks wish they could play the Los Angeles Lakers every night. "I’m not sure what it was, but I was able to have two good games against them," Knight said. "Some teams you just match up well against and we did this year against the Lakers." "They did a good job of cutting off a drive to the basket, but I was able to step back and get a good jumper that went down," he said. "It really felt nice to win a game like that." "We feel very fortunate that we were able to play well both times that we faced them, but I don’t really sense pride in beating them twice to be honest," Bucks coach Larry Drew said. "We probably ran more pick-and-roll than any other game we played. But we really were just focused on trying to open up the floor and both guys were getting to the basket and making shots," he said. "They seemed to play well off one another tonight. 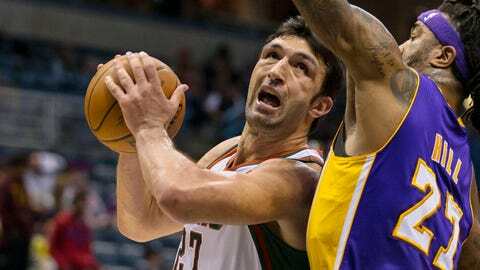 I played them both heavy minutes but they responded very well." "This is the NBA where anyone can win on any night," he said. "You have to give them credit. They were more aggressive than we were at the end and really took it to the basket hard." "I felt like we could get it done, but it didn’t happen," Young said.